Sports broadcast events are attracting the most live viewers. Live events are very rich in possibilities for brands as they are one of the few things we watch together. Sporting events create opportunities for great TV exposure, showing sponsor logos on jerseys, banners, equipment. Such exposure creates brand familiarity and helps the logo stand out from competitors. For example sports apparel and equipment companies, like Adidas or Nike, are 6 times more likely to sponsor professional soccer than the average of all sponsors, according to an IEG research. TV is becoming a bigger and bigger part of sponsorships. Most consumers do not go to games any more. They are watching on television at home, in 60-inch plasma, most games are available on cable service or satellite provider. And this is a fundamental change that teams and leagues think about – how consumers are engaging with sports now. Sponsorship is about how do you put your brand in place where you are in the intersection of passion and connection and you are able to communicate with consumers on a level where they are expecting it, it is organic, it is authentic. But how does it work in practice: A representative for Europcar, a Paris-based rental car company that was the title sponsor of a French cycling team, said in a Wall Street Journal article after the team competed in the Tour de France that the company was “calculating every second that our logo is seen on the screen” and “there is no doubt this Tour has paid for itself.” Europcar paid an estimated 6 million dollars for the cycling sponsorship. Some would argue that measuring logo exposure is not a good metric but the truth is that the number of appearances of a logo, its position, size and duration provide indexes and statistics that are used for marketing analysis. These statistics are, in fact, used by the sponsors to estimate the number of TV viewers that noticed them and then evaluate the effects of the sponsorship. Finally, these parameters can be used as a feedback for a sponsor to check if the visibility of a logo justifies its sponsorship engagement: the visibility of a logo can be seen as an indication of the expected revenue for the sponsor. 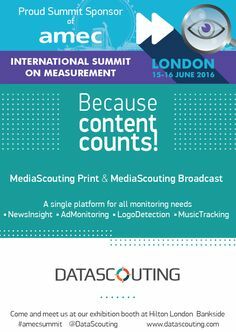 It is absolutely vital that you are able to track the length of time that each viewer spent watching your brand. Being a marketer, every second of your brand exposure is vital and you want your audience to watch it to the end. How visible the sponsor was: that helps brands quantify the amount of broadcast exposure their sign is getting during broadcast. Based on that a brand can negotiate with a broadcaster to change the color of the sign or change the location of the sing to make sure a brand gets more exposure during the broadcast. At DataScouting we believe that by knowing exactly when a logo is running – in almost real-time – is a significant step towards effectively measuring TV sponsorship. 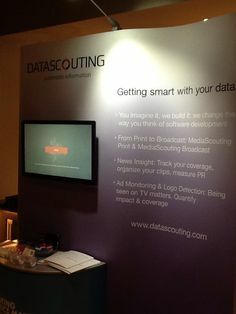 DataScouting has launched a new version of MediaScouting Broadcast empowered with logo and advertisement detection to assist companies effectively monitor their sponsorship on TV. Logo detection has been designed to automatically detect and recognize logos and trademarks in TV, eliminating the time of manual brand detection. For more information please contact Sophia Karakeva (soka@datascouting.com). You can also watch our webinar: Measuring the value of TV Sponsorships. This webinar was presented as part of the AMEC Measurement Month in September.